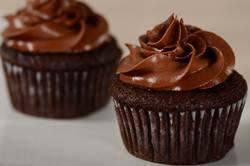 Banana Chocolate Cupcakes covered with lovely swirls of Chocolate Fudge Frosting give us a double dose of chocolate. You will love these tender and moist cupcakes that are oh so sweet. They go perfectly with the silky smooth texture of the chocolate frosting. Not only do they taste divine, but as you can see, they are a feast for the eyes. The chocolate fudge frosting recipe is adapted from the cookbook Chocolate Bar by Matt Lewis and Alison Nelson who run a chocolate boutique that they call a "candy store for grown-ups" in New York. It is the type of chocolate frosting my mother always used to cover cakes. Made with butter, confectioners (icing or powdered) sugar, vanilla extract and unsweetened chocolate, it is perfect for piping. It uses unsweetened chocolate which is also known as baking, plain or bitter chocolate. This is chocolate in its rawest form. Chocolate liquor that has been refined and contains 50-55% cocoa butter. Since no sugar has been added to the chocolate it has a strong, bitter taste that is used in cooking and baking but is never eaten out of hand. When used in this frosting it imparts a deep chocolate flavor. Ghirardelli and Baker's unsweetened chocolate can be found on the baking isle of most grocery stores, or other brands I particularly like that can be found in specialty food stores or else on line are Dagoba, Guittard, or Scharffen Berger.